Shed skins and faecal pellets. Light brown empty skin cases and tiny faecal pellets - about the size of a grain of salt. 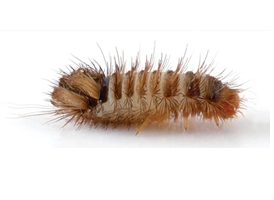 Live or dead adult Insects - You may see the tiny beetles – small, dark dots – slowly climbing walls towards windows, or otherwise dead at or around windowsills. Carpet Beetles are not particularly dangerous to humans, but they can cause significant damage to fabrics in your home. 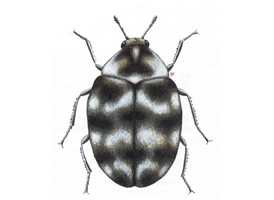 Carpet beetles can be difficult to get rid of without professional help. Our treatment requires one visit. If the loft space requires treatment, an extra £30 is charged. If you book a treatment, there are things that you need to do before and after the visit. It is very important that you follow these instructions to ensure that the treatment is successful.